A woman carrying a child was struck in a hit-and-run in El Sereno. 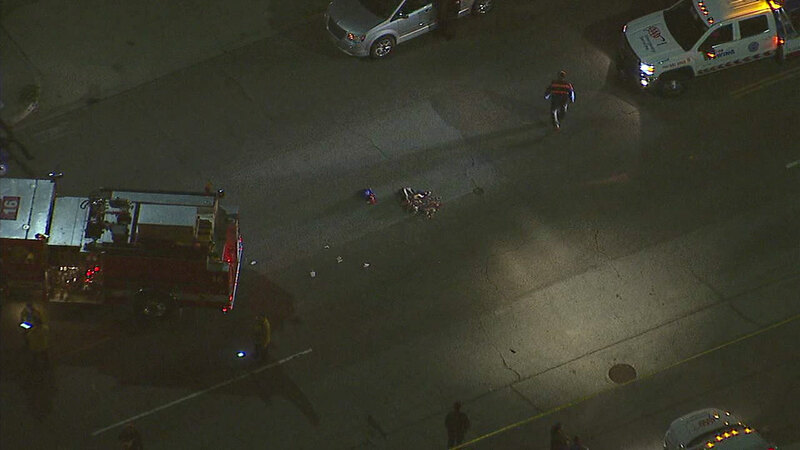 EL SERENO, LOS ANGELES -- A mother was carrying her 2-year-old son when the woman was fatally struck by a hit-and-run driver on a street in El Sereno on Wednesday evening, authorities said. The collision was reported at 6:45 p.m. at the intersection of Alhambra Avenue and Endicott Street, according to the Los Angeles Police Department. The driver of a dark-colored SUV hit the mother as she was crossing the street with the toddler in her arms, investigators said. "She may have been struck twice," said LAPD Capt. Alfonso Lopez. "We have conflicting statements." The woman died at the scene after she apparently threw the boy to safety just before the impact. "The 2-year-old son did not sustain any injuries and was transported to the hospital and is in good condition," Lopez said. Witnesses said the collision sounded like an explosion. "Nothing like metal on metal, just like a thump," said El Sereno resident Daniel Moran. "Just to see it happen in front of you and think, oh, damn, she's not getting up or she's not moving. It's like ... someone's gone." A white sheet, apparently covering the deceased victim's body, was seen in the roadway as officers and firefighter-paramedics remained at the scene. The woman was not immediately identified. The suspected driver remained at large.